In the completion of a game paused by rain on June 11, Portland knocked off the Altoona Curve (PIT), 4-2. Mike McCarthy came on in the third in place of original starter Keith Couch, and allowed only one run on five hits in five innings to earn the win. Miguel Celestino struck out a pair in two perfect innings to secure the save. Portland's offense was powered by a pair of two-run homers. Stefan Welch hit his back on the 11th, while Sean Coyle blasted his seventh of the season after play resumed. 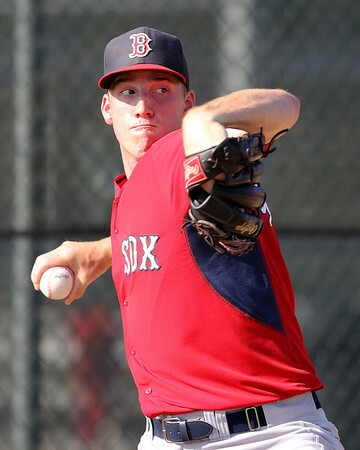 In the nightcap, Henry Owens fired a seven-inning shutout in a 3-0 win. Owens lowered his ERA to 1.99, scattering five hits and striking out eight while walking only two. It marks the fifth consecutive win for Owens, who improves to 9-3 on the year. Jonathan Roof led the offense, going 2 for 3 with a walk and two runs scored. Roof is 15 for 48 (.313) since his promotion from High A Salem. David Chester and Derrik Gibson also had two hits apiece for the Sea Dogs. Salem dropped a 5-1 decision to the Winston-Salem Dash (CWS). Corey Littrell allowed three runs on five hits, including a pair of home runs, in 5 2/3 innings. He struck out six and walked two. Kyle Martin follwed, giving up two runs on five hits in his 2 1/3 frames. Reed Gragnani provided most of the punch, with two of the team's six hits as well as a walk and run batted in. Greenville was firing on all cylinders in a 21-1 blowout over the Savannah Sand Gnats (NYM). The 20-run margin is the largest victory in Drive history. The support was more than enough for the best start of Teddy Stankiewicz's young career. The second-round pick in 2013 no-hit Savannah for five innings, before giving up a leadoff single in the sixth. Overall, Stankiewicz allowed just one unearned run on two hits in six innings. He struck out three, walked two, and induced 11 ground ball outs. Jacob Dahlstrand fired three shutout innings to earn the save. Every starter in the Greenville lineup had at least one base hit. Tim Roberson (pictured, right) led the way with a monster game, delivering four doubles and driving in seven runs as part of a 4-for-6 night. Wendell Rijo had three hits, including his third triple of the year. Carlos Asuaje was 2 for 3 with a walk and three RBI. Perhaps the most amazing thing about the Drive's 21-run show was that it did not include a home run, but rather an attack that included 14 singles and seven walks. Lowell walked off with an 8-7 victory over the Tri-City ValleyCats (HOU). Knotted at seven in the bottom of the ninth, Nick Longhi led off the inning by beating out an infield hit. After a Sam Travis strikeout. 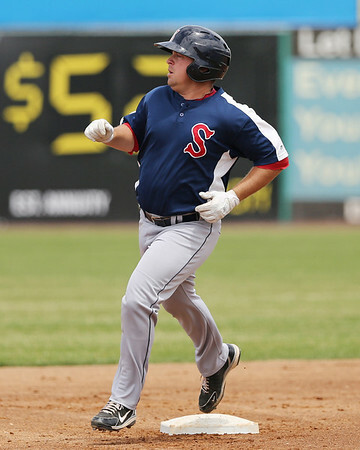 Longhi advanced to second on a Franklin Guzman single and came in to score the winning run on a base hit by Mike Meyers. Longhi had entered the game in the seventh as a replacement for the recently-signed Andres Torres, who was 1 for 3 in his first action of the season. Eighteenth-round pick Jordan Betts had a big night at the plate, going 3 for 3 with a home run, a double, and three runs scored. It was the second homer in five games for the former Duke Blue Devil. Jake Drehoff got the start for the Spinners, allowing only one run on three hits in four innings. He struck out three but struggled some with his control, walking four and hitting a batter. Edwar Garcia was hit hard in relief, giving up five runs (four earned ) in his 2 1/3 innings. Ellis Jiminez got the win, giving up a run on two hits in 2 2/3, striking out three. The GCL Red Sox kicked off their season with a 6-4 win over the GCL Twins. Sergio Gomez took the ball for a rehab start, allowing a run in his only inning of work. Dedgar Jimenez got the win as he made his stateside debut after spending 2013 in the Dominican Summer League. Jimenez allowed two runs on five hits in four innings, striking out one and walking one. Luis Ramos fired a pair of scoreless frames, and Yankory Pimentel allowed a run in his two innings. Jose Vinicio, on the disabled list since April 8, began his rehab by going 2 for 3 with a double. Javier Guerra tripled and drove in a pair of runs as part of a 2-for-4 afternoon. Rafael Oliveras also had two hits for the Sox. The DSL Red Sox fell 5-4 to the DSL Yankees1. Enmanuel De Jesus took the tough-luck loss, allowing just one run on two hits in his four innings. De Jesus struck out four, and has 16 punch outs in 16 2/3 innings through four appearances. Despite a report that he a promotion to the Gulf Coast League was imminent, Rafael Devers was hitting third, where he went 1 for 4 with a run scored. Yoan Aybar saw his seven-game hitting streak come to an end on Wednesday, but he came back on Friday with a pair of hits, including an RBI double. Player of the Day: It was a record-setting offensive performance for Greenville, who tied a team record with 21 runs and set a new mark with its 20-run margin of victory. At the center of the performance was Tim Roberson. Getting the start at first base, Roberson drove in seven runs and double four times. Signed as an undrafted free agent in 2011 out of Florida Gulf Coast University, Roberson's 15 doubles have set a new career high.